First day back in Paris and already have a loooooong to-do list on hand. Happily though, we are having a spell of Indian summer at the moment, so it’s not too big of a shock to be back from Malaysia. Additionally, the presence of sunshine makes me very happy. So I decided to walk home this evening and on rue de la Glacière, I came across a florist that not only does beautiful flower arrangement, they even put on smart window display by creatively use fruits to transform it into something new. 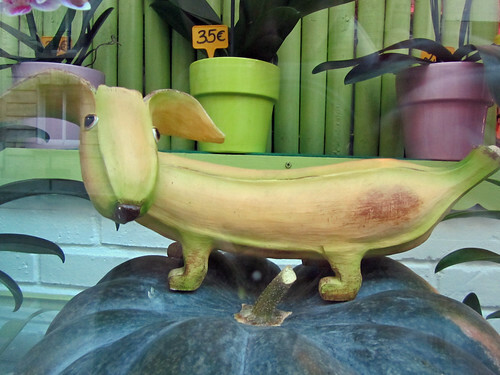 In this case, meet banana-dog. Isn’t he adorable?